It's no surprise that Colombia has become a top travel destination in the world. Its a country in transformation which makes it an exciting time to discover it. We've made Colombia our home base the last three years and traveled extensively throughout it and developed 3 Colombia itineraries to enjoy your 2 weeks in Colombia and to help you choose where you want to go, what you want to do including suggestions on where to stay and eat and some tips on how to plan your trip. Travel Colombia: What kind of experience are you looking for? Even though most vacations in North America are two weeks, you will still have enough time to explore sections of the country for a glorious 2 weeks in Colombia. It will be enough time for you to wet your appetite to explore and experience it again, but first some important tips to know before you arrive. 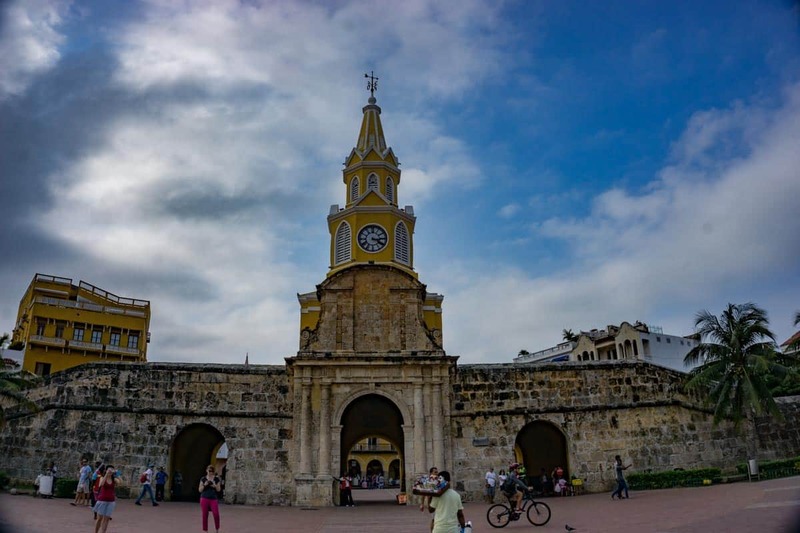 There are many misconceptions and surprises about Colombia, here are 15 things you need to know before traveling to Colombia. Thanks to easy-to-plan, comfortable, and well-priced bus services, and flights, it's easier than ever to travel independently around Colombia. 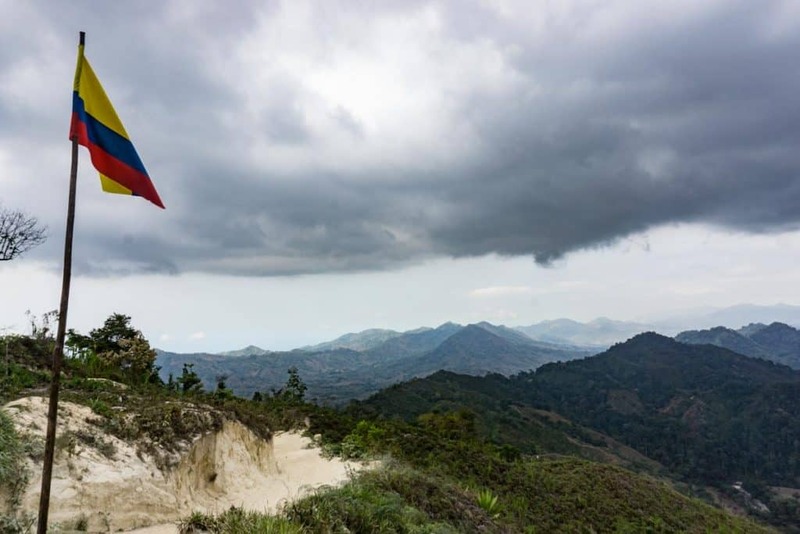 Flights are reasonable, and by road, be prepared for some long windy Colombian roads that navigate around the mountains where you will see some of the most spectacular views in the country. Viva Air is Colombia's low-cost airline and a good choice for inexpensive travel between cities. It will save you time if your Colombia vacation is limited. Keep in mind to check the fine print for baggage allowances and requirements (such as printing your boarding pass in advance) these extra charges can add up. Book at least 2 weeks in advance to get the best pricing. Avianca is Colombia's national carrier and often has super promo fairs if you book ahead. If you are in Colombia, book in Colombian pesos to get even better fares. Latam is another option for domestic flights around the country. Depending on where you are traveling there is also smaller domestic flights out of Medellin's inner city airport with airlines such as ADA, Easyfly and Satena. Numerous bus lines operate nationally or regionally across Colombia. All cities and towns have a bus terminal where several different companies have service desks that offer varying bus service options and schedules. In the main cities, you can Google the terminal to find the bus companies, schedules, and pricing as it varies in each terminal varies. Usually it is not required to book seats in advance, however weekends and major Colombian holidays (like Easter, Christmas until January 15th) are busy. Its wonderful to see Colombian's discovering their own country after years of war and limited ability to travel around their country. Bus services are reasonably priced and quite comfortable for travel all over Colombia. Options vary from larger coach-lines with A/C, reclining chairs and bathrooms, minivans that carry 12-14 passengers to cars. The bus type varies depending on the schedule and the destination, just inquire at any bus terminal. Note that buses tend to be heavily airconditioned, so bring a jacket, and be prepared for music playing or movies at above average volumes! 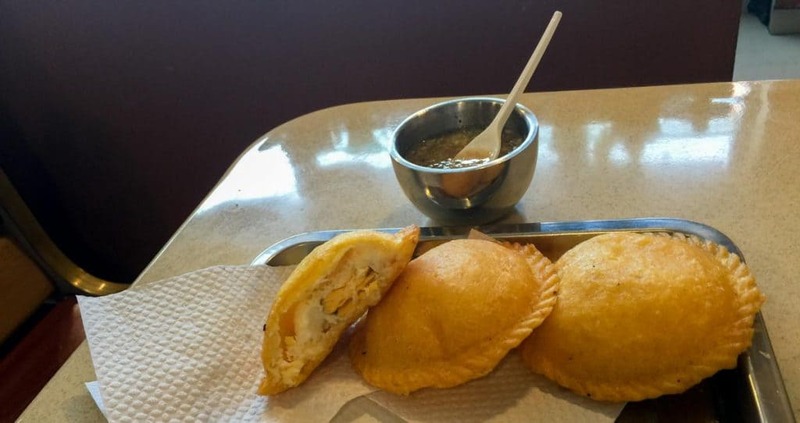 Long trips include a stop for dinner (like Medellin to Bogota) and there are always food vendors who jump on the journey and sell empanadas, sweets, icecream and anything you can imagine. 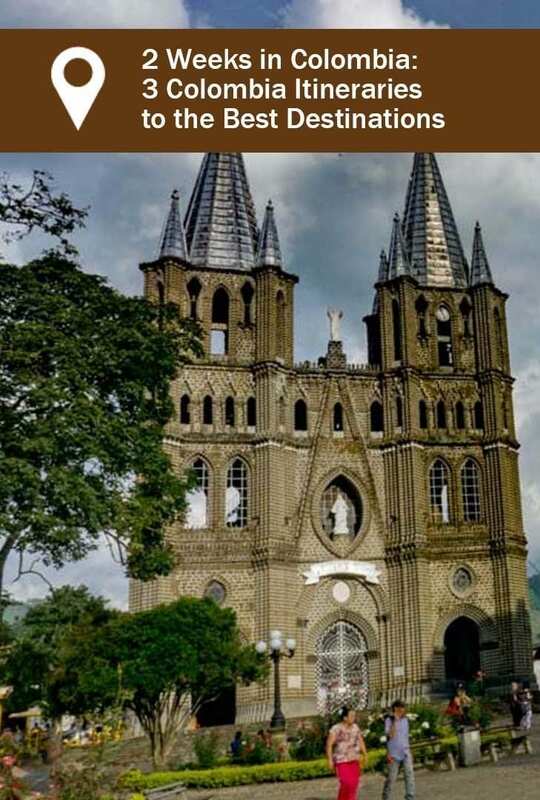 Colombia Itineraries: What Experience Are You Looking For? Every traveler is different. Some travelers want more of the outdoors and hike to the Lost City; some travelers want to experience more of the city life and others would be happy to get a cross section of regions. We've put together three comprehensive itineraries, customized according to your preferences. Major city attractions including Bogotá, Medellín, Cartagena, and Cali. Visit the Tayrona National Park and wander through some of the best historical towns. Highlights of Bogotá and Medellín. Outdoor adventures on the Caribbean Coast and hike the Lost City. 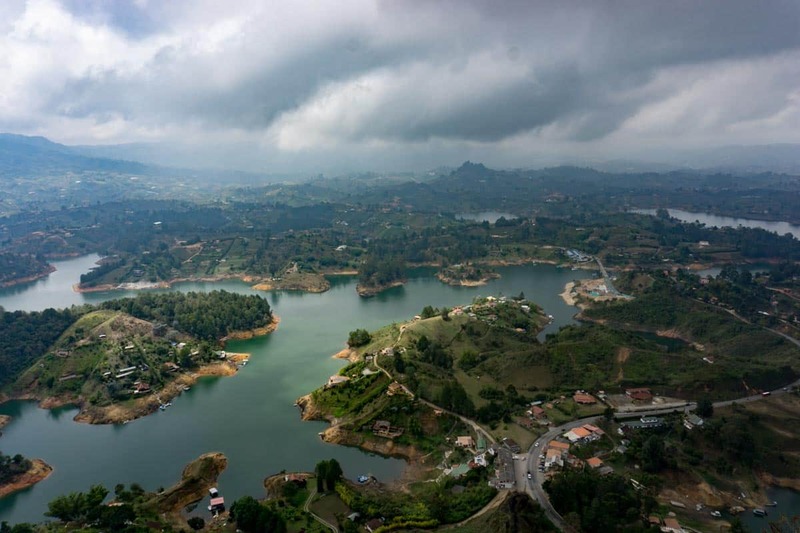 Highlights of Bogotá, Medellín and the southern region. Includes nature, colonial towns, and historical sites. Includes major city attractions of Bogotá, Medellín, Cartagena, and Cali. 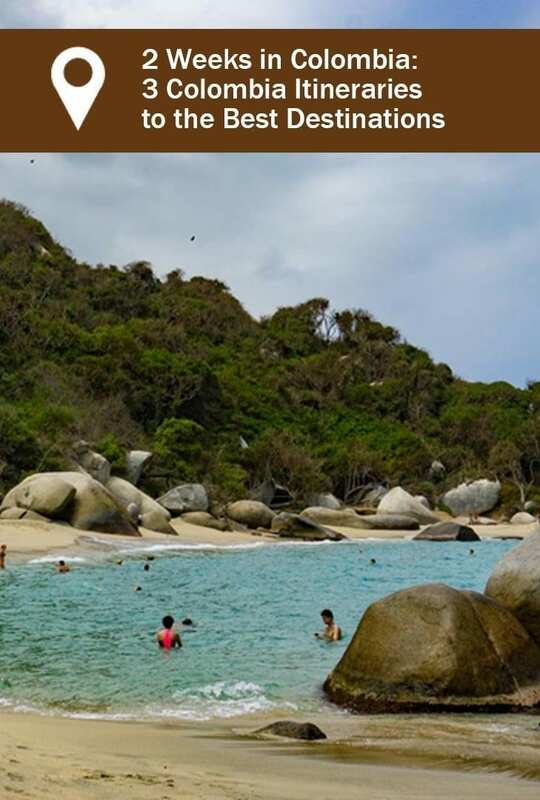 Visit Tayrona National Park and wander through some of the best historical towns. Visiting the capital city of Bogotá is a must. It's historical, gritty, eclectic and interesting. It is also enormous with its 10 million residents making it difficult to get around and there isn't good local transport. We definitely recommend doing local tours. There are many great places to stay in Bogotá. 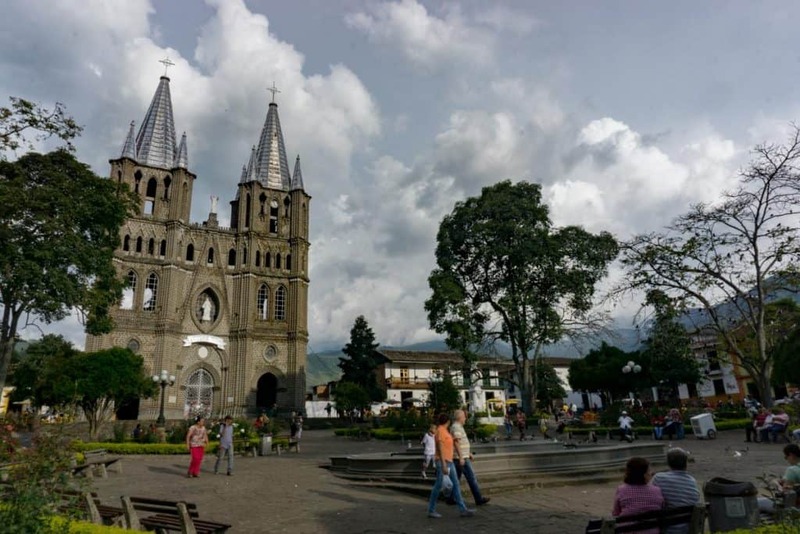 Some of the popular neighborhoods include Candelaria, Chapinero and Zona Rosa. Each of these offer different pricng and comfort options in the best neighborhorhoods of the city. 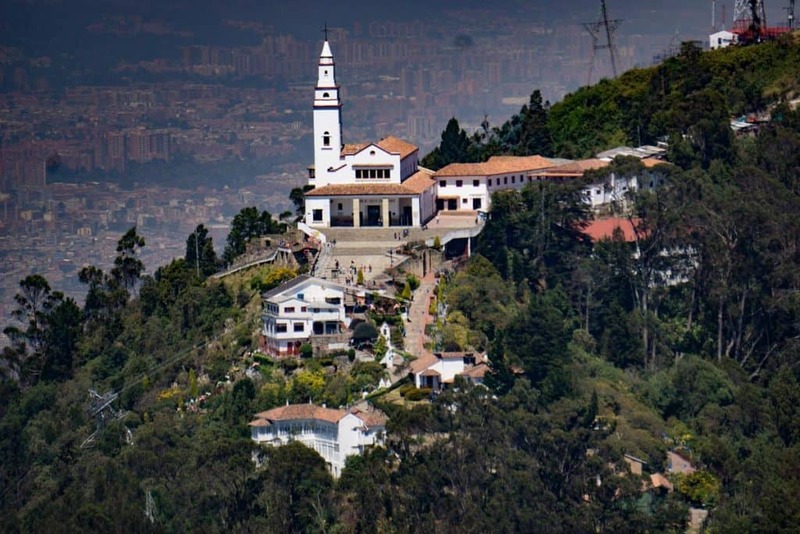 Enjoy awe-inspiring views of Bogotá by visiting the Guadalupe Hill (3300 meters) or Montserrat (3100 meters) to get the best focal point of the city. Bogotá has the best foodie scenes in all of Colombia. Take in a local food tour, and definitely check out how the coffee and cafe scene is evolving. This food feast and coffee workshop may do the trick. Check here for prices and availability. 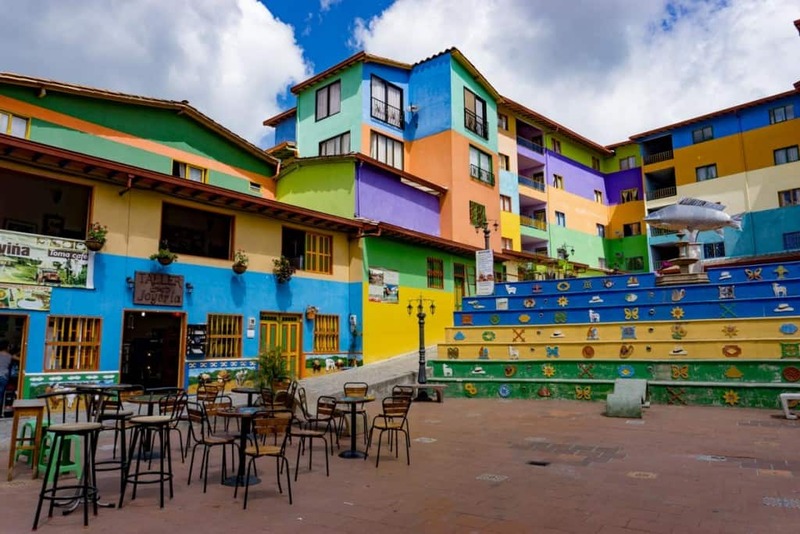 Check out this video below to see why Zipaquira is worth a visit. Take a night bus from the main terminal (plenty of different options) or to save time, fly to Cartagena. - Take a historical walking tour around the Old walled City and the historical neighborhood of Getsemani. 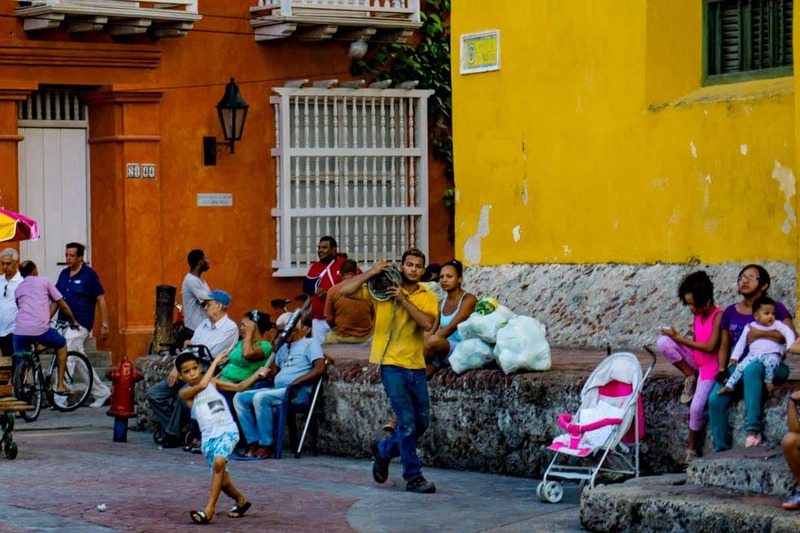 Our favorite part of Cartagena is the area of Getsemani - a regentrified area outside the wall known for the area where the workers of the walled city once lived. - Wander inside the many cathedrals and museums inside the wall. - Walk on the beach and people watch in the Boca Grande district. 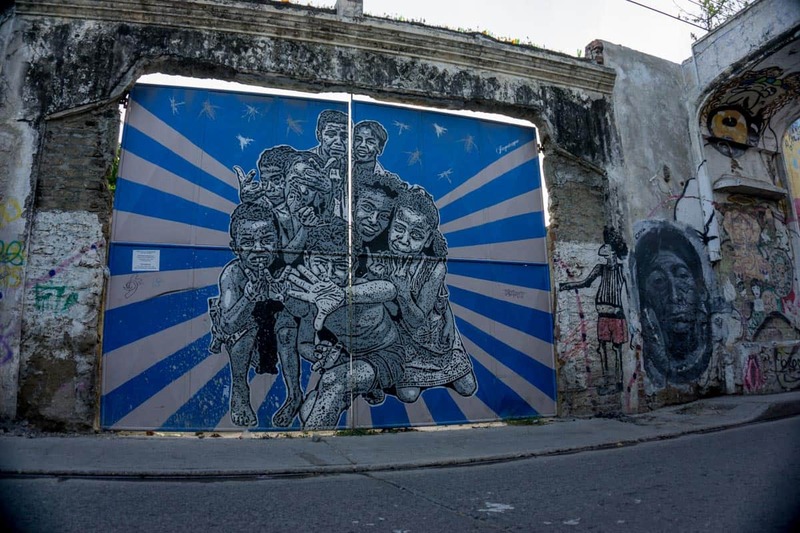 - Saunter the streets of Getsemani and admire the architecture and street graffiti. 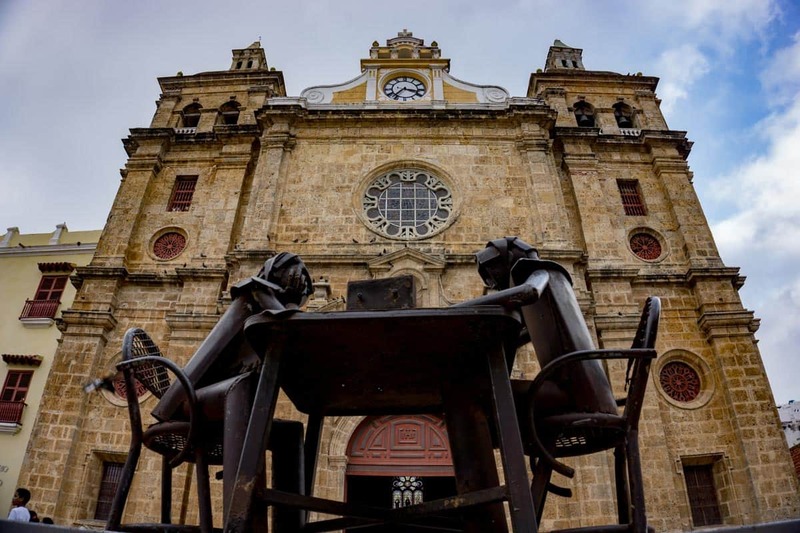 -Enjoy an arepa and a beer and watch a soccer match on the plaza, kids play or in the evening an outdoor movie – all in front of the church. - Watch the sunset looking over the Caribbean sea from the wall of the old city, take a beer and sit on the edge. Many local kids and families will join you. Here is a great city tour to see it all ! Check here for prices and availability. Watch nighttime entertainment including dancing, music and stop for a drink at the Plaza Santa Domingo. We prefer staying in Getsemani – more of a local experience without breaking your wallet. 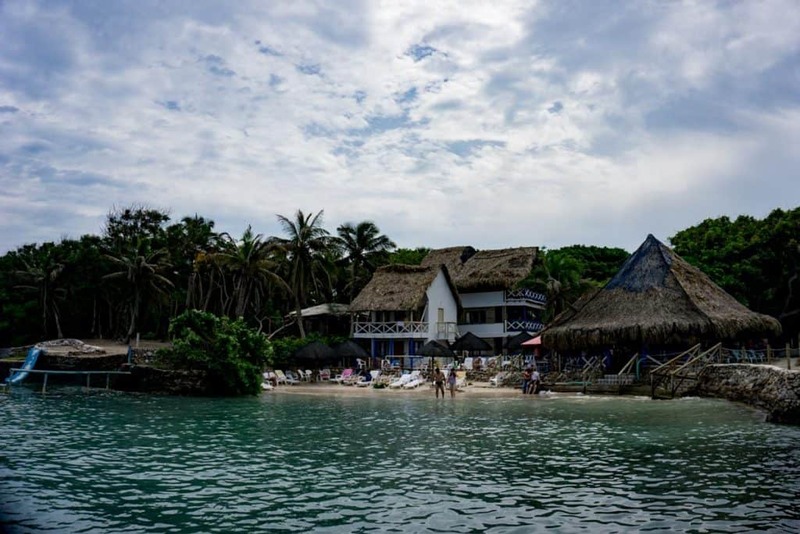 The Beach Hotel - For a special treat, this place is located on a strip of land across from Cartagena only reached by boat. Check out this incredible location, availability and latest pricing. You need a beach day in Cartagena, why visit this Caribbean if you don't spend a day at the beach! The best beaches aren't in the city, but an hour boat ride out of town. Walk to the pier at El Muelle de la Bodeguita, across the street from the old town. Go to any of the office windows and book a day trip. We went to the Rosario Islands.This is a one-hour boat ride – to enjoy your option swimming, snorkeling, diving, hiking, lunch, then return. Unlike in Cartagena, the waters here are pristine, clear and blue, and it's the best place to swim in the area. Check out this option to get to Rosario islands - prices and availability here. When in Cartagena your hotel can help you arrange transport to Tayrona.or you can head to the bus terminal to choose a carrier. The bus trip is around 4-5 hours Where (depending on stops). There are a number of very interesting accommodations closer to Santa Marta. Check out these two interesting places (plan to spend alot more to stay near the park- but these places are worth it!) These cool eco hostals are just 2km away from the park. Eco hostal Yuluka Check this cool stay! Wander all day in the park, run, swim, hike and relax. Spend the day visiting many of the beach areas within the park. Walk the trails and witness some of the most amazing diverse views! Check out our video on our day trip to Tayrona. We loved Minca! It's an eclectic, energetic town with lots to do. Find out how to get there, what do to, where to stay, and where to eat. Everything you need to know is in this post about Minca. Travel Colombia requires a stop in Medellín. It's not only a beautiful city, going through massive transformation, the Paisa culture (people of Antioquia are different than the rest of the country. After you arrive in Santa Marta, Take a bus to Medellín (16hrs) or take a flight to Medellín (less than 2 hrs) Take a cab into the city (roughly 45-50 minutes into town). To determine how much you should pay for cab fare, try this app. for any city you travel. Medellín is very easy to travel around with its efficient metro system, Metro de Medellin. 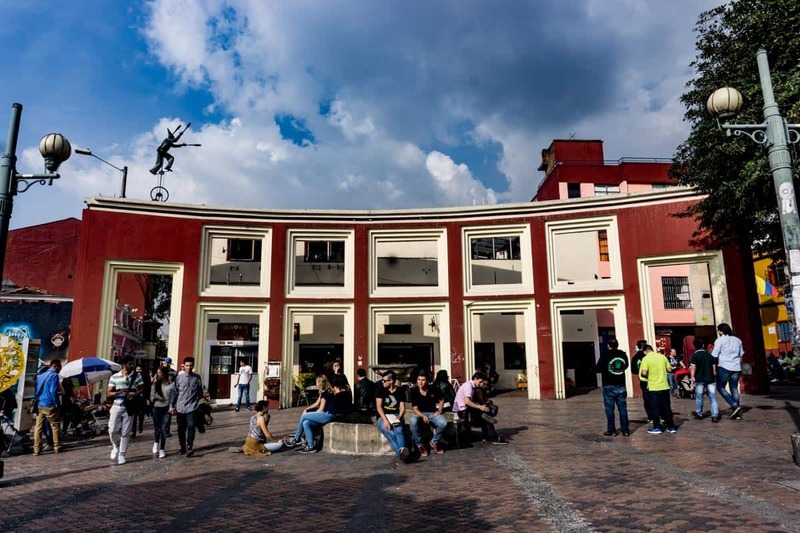 Most visitors typically head in El Poblado during their first visit to Medellín. It is a tourist-friendly area with plenty of locations. We recommend for cost, convenience, and service: The Grand Hostel in El Poblado. 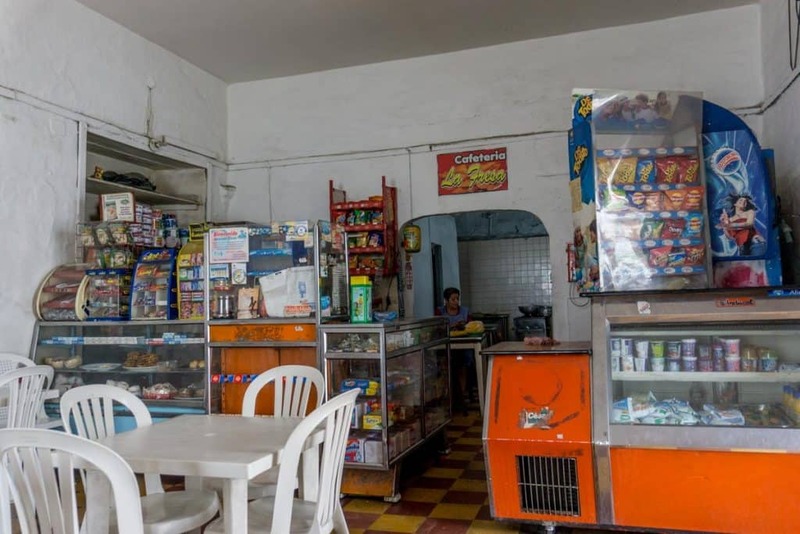 This is a place with friendly and attentive staff (operated by a lovely Lady Lucy and her dog Lucas), with both private and dorm rooms, and proximity to the El Poblado Metro station. Check prices and availability here. A few of our other favorite spots to stay in Medellin. The Art hotel - In Poblado - Modern, funky near many restaurants just outside of Parque lleras. Check out this hotel for prices and availability or try the Las Rosas Boutique hotel it will be in a less action packed area than the Art Hotel. Check prices and availability here. 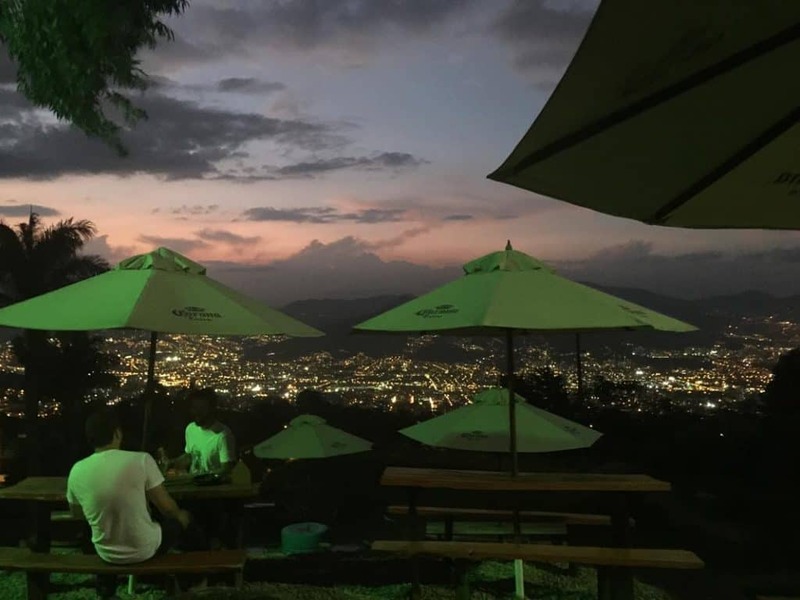 Envigado is the city right beside Medellin and is a great place to stay as its less expensive and literally at the door step of Medellin with a more local flavor. This is close to the Colombia Immersion Spanish school, a school that has a more community and local approach to learning. and set in a local neighborhood, which is a perfect place to appreciate a local community and practice your Spanish. A few options to stay in Envigado include: The Arame hotel Check prices and availability here. There are al numerous Airbnbs in the area. Get your bearings with a Walking Tour around the city. This will give you the perspective of what to see and do for your visit, and learn some history and travel tips. Hike up to the mountains and find waterfalls and chill in one of the most beautiful natural spots so close to the city. Arriving at the first waterfall into our hike. Take the cable car up to Parque Arvi and walk through the parks and forests. check out this private city tour to do all this - prices and availability here. Visit the Minorista market downtown to savor the best variety of exotic fruits you have ever seen! Watch a Colombian football (soccer) game and witness some of the most passionate fans ever! Check out the video from our first Colombian Football game. 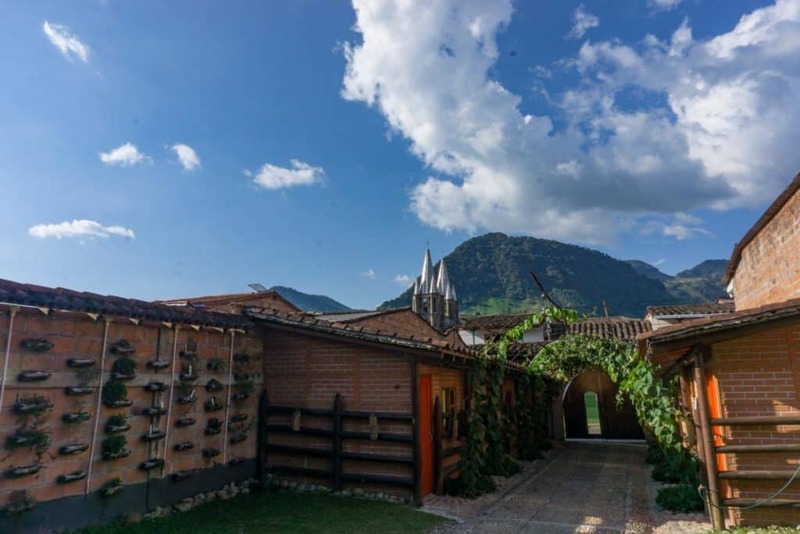 Take in one of many museums like the Museum of Antioquia or our favorite the Casa de Memoria. On Sundays get some exercise at Cicloviá – from 7 am to 1 pm. Avenue Poblado is closed to vehicles and open for cycling, running, and dog walking or just plain walking. This event is perfect for a great day of exercise, followed with a refreshing drink at one of many juice stands along the way. This is one of our favorite day trips (or overnight if you can spare the time). For details how to get there, and what to do you can find out all about the coolest colorful town of Guatapé here. Stay in Medellín and book a day tour to see and participate in a chocolate workshop at a cocoa farm. The Palenque tours offer an incredible tour of a Cocao farm where you find out how farmers have gotten past the dark days of the war and now have a thriving chocolate business. We captured the story of this Cocao farm and how it's changed from the dark past of the Colombian war. 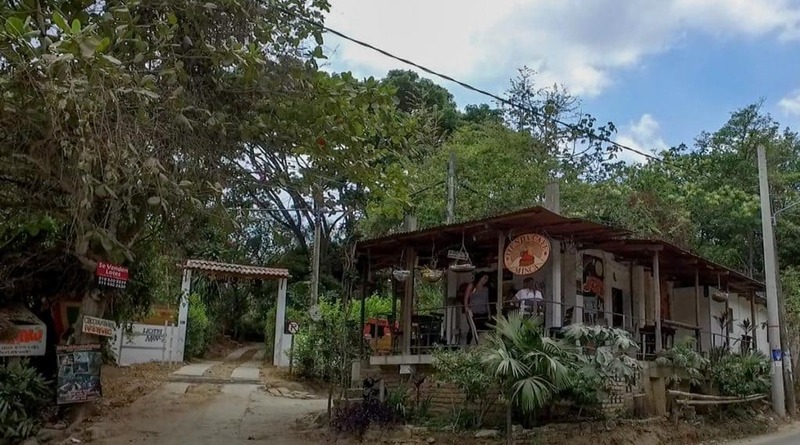 Palenque also offers excellent coffee tours in this area (you don't need to be in the coffee zone to see and taste good coffee). With this trip to Cali, you will cover off all major cities in Colombia. There is a lot to see in Medellín and you may opt to stay and explore more. 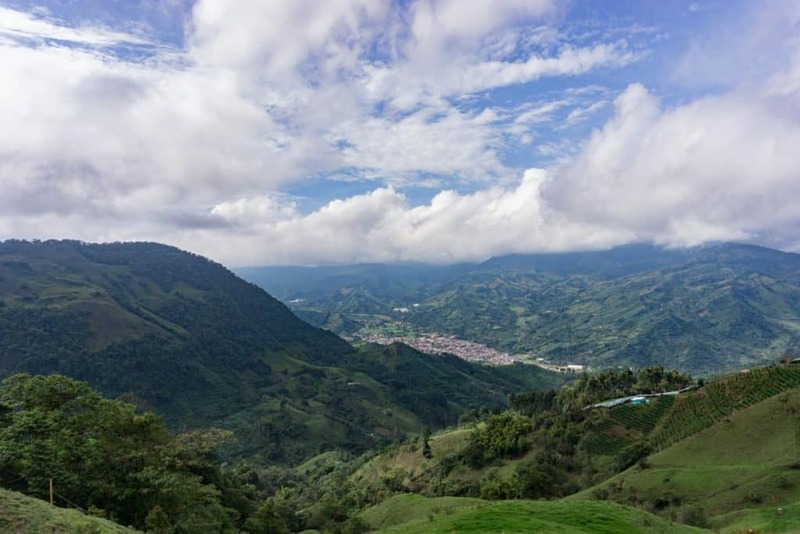 Cali, however, will give you a different perspective on Colombia. It is also a city in massive transformation after the dark days of the Cali cartel were over. The city is renewing and renovating with parks, restaurants and social projects. Not to mention it's the home and birthplace of SALSA! Your best option is flying. Otherwise, it's an 8-10 hour drive. If you are on a limited vacation period, taking the plane is your best bet. Travel within Cali: Taxis are everywhere and economical as there are metered taxis. However, we didn't take a bus, which is called the Mio – similar to the Transmilenio in Bogotá. It's reasonably priced and efficient (although it can get very crowded during rush hour). Uber runs a low cost and efficient service in Cali as well as in Bogotá and Medellín. We recommend a city tour to allow you to get a first comprehensive impression of Cali. It's a great overview of popular neighborhoods, as well as the downtown area. 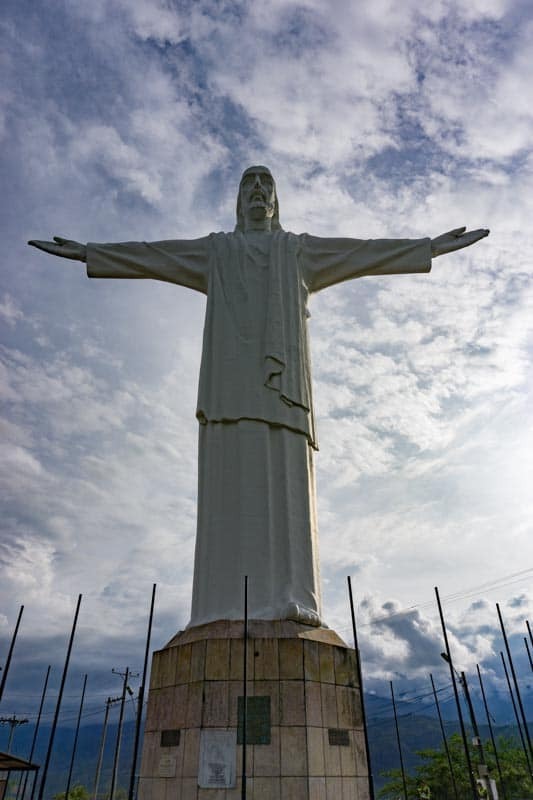 Cristo Rey is a Christ statue located high above the city, with numerous parks and urban projects underway. Check out this well-priced extensive 3 hour tour of Cali to check all the sights and sounds and get a flavor for the city. Check prices and availability here. Of course, Salsa Dancing is a good reason to come to Cali and included here is a good directory of where to find the best clubs, schools and events. Fly back home via Medellín or Bogotá depending on your airline. Sadly, your trip may be over at this point, but if you still have time, we have two other itineraries below that offer a few different options for destinations if you can spare the time. Major city attractions in Bogotá, Medellín, Cartagena, and Cali. 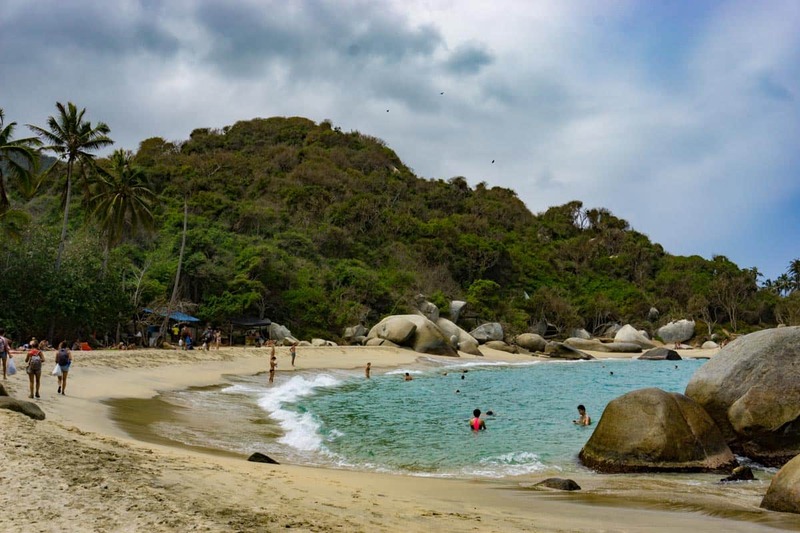 Visit the Tayrona National Park and wander through some colonial towns. Highlights of Bogotá and Medellín. 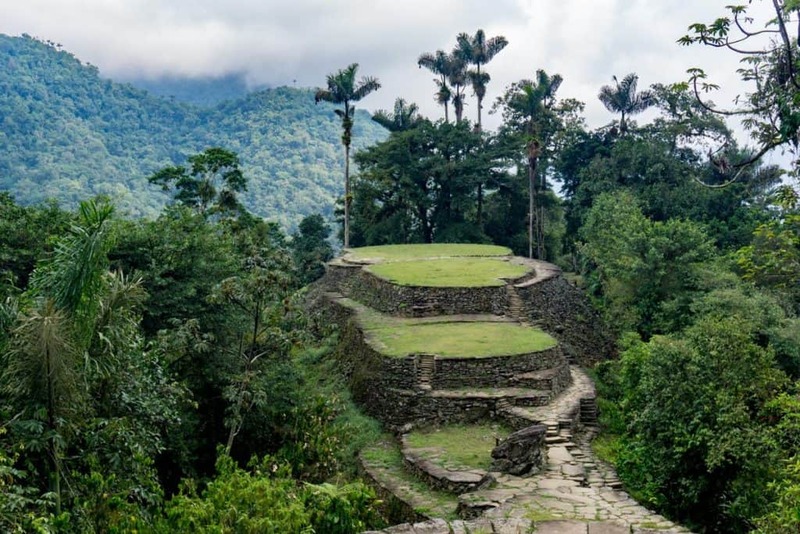 Outdoor adventures on the north coast and hiking the Lost City: The Ciudad Perdida. Highlights of Bogotá, Medellín and more time in the south. This itinerary includes nature, colonial towns, and historical sites. Travel Colombia to see Bogotá is a must. It’s recommended to do local tours in Bogotá as it’s difficult to get around this gigantic city of 10 million population. We discovered the best places in this city from local recommendations. We recommend Impulse Travel as they offer several city tours as well as outdoors and local culture trips to suit any travel style. Wander around the Historic La Candelaria district – Bogota’s old town and home to the city’s most impressive Spanish colonial architecture. 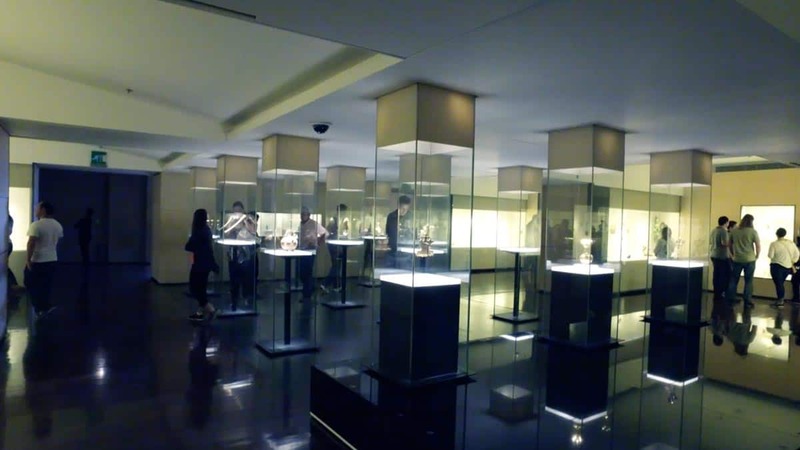 Visit the Gold Museum – see thousands of captivating, ornate gold pieces made by the extinct pre-Colombian Teyruna people. 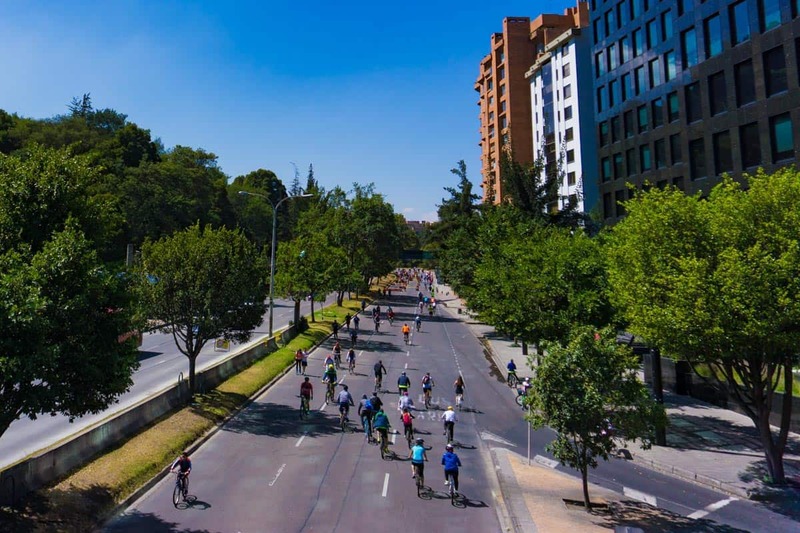 If you are in Bogotá on Sunday, you must take in Cicloviá – from 7am-2pm the road is closed for cars – and open for runners, bikers, walkers and dogs. It gives you a new perspective of the city and 2 Million get outdoors to enjoy the roads every Sunday! 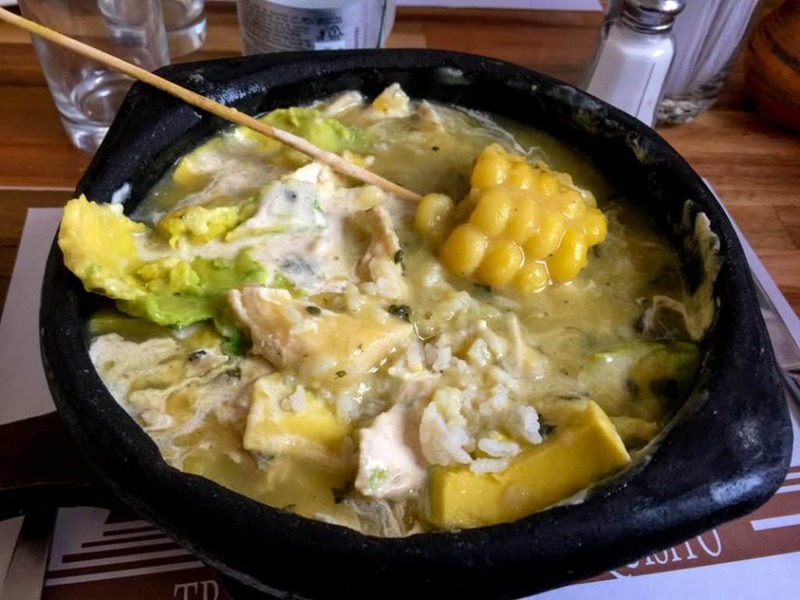 The dish called Ajiaco – most popular in Bogota. A creamy chicken chowder with corn, potatoes, capers, served with rice, and avocado. It’s incredibly hearty and perfect for cool Bogotá nights. There are a number of good areas to stay in Bogotá. We stayed in Chapinero which has good restaurants and bars. 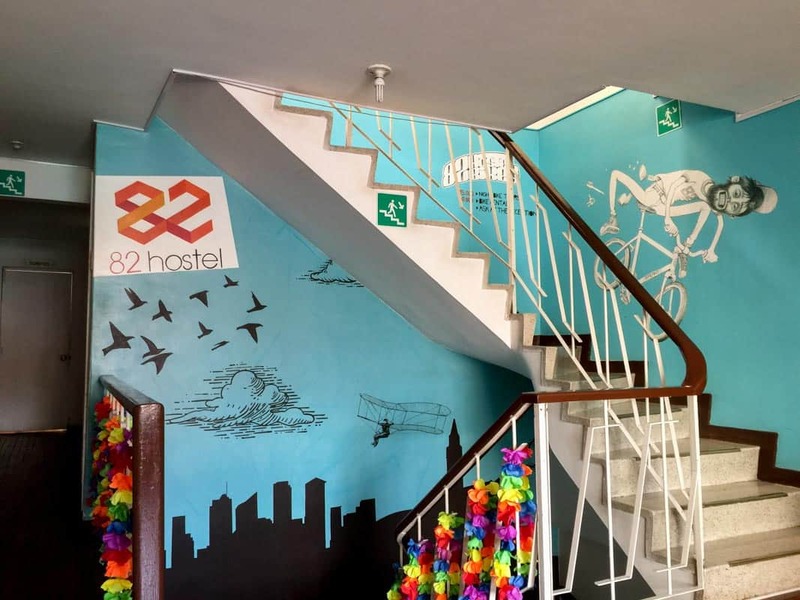 We also stayed at 82Hostel. This is a good, friendly hostel with private rooms, free breakfast, and nice atmosphere. 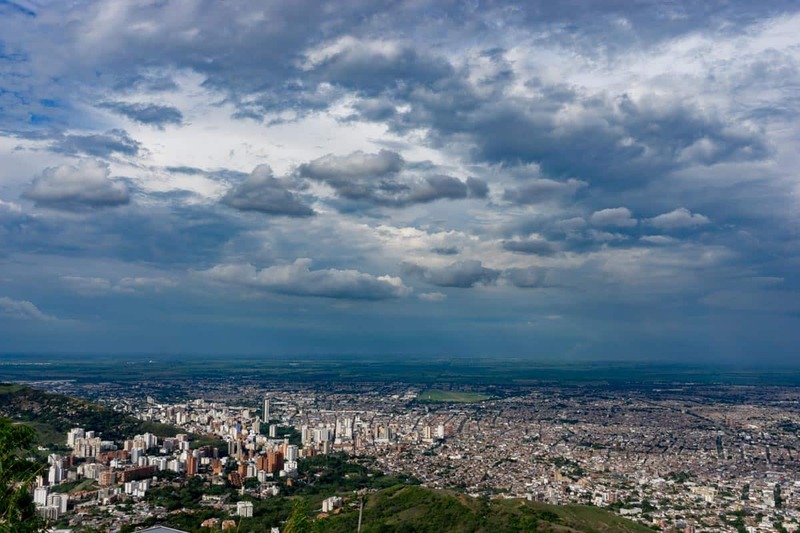 Enjoy awe-inspiring views of Bogotá by visiting the Guadalupe Hill (3300 meters) or Montserrat (3100meters) to get the best focal point of the city. Bogotá has the best foodie scene in all of Colombia. 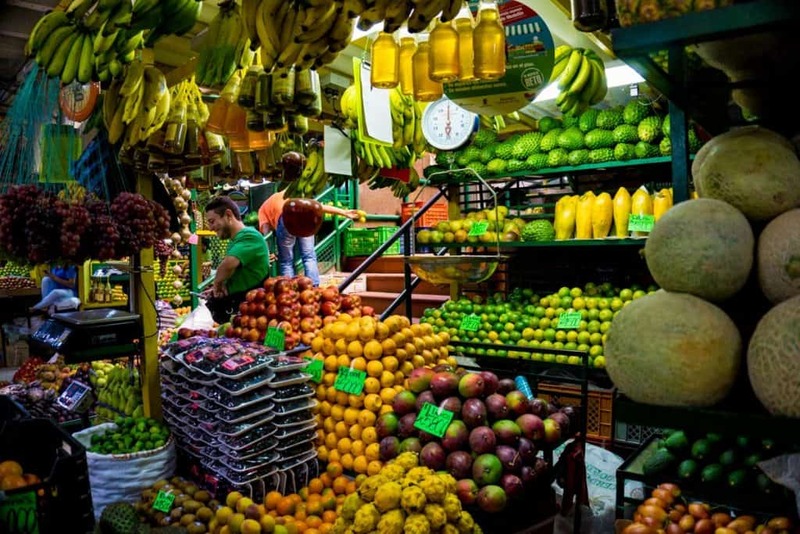 Take in a local food tour, from great tour operators like Bogota5. Leave the city for a half-day to visit the delightful Colonial town of Zipaquirá. Visit the Salt Cathedral in this city, a cathedral 200m underground made of interlocking tunnels with 14 chapels and three shrines. Depending on traffic it’s a 1hour drive from Bogotá. Travel Colombia requires a stop in Medellín. It’s not only a beautiful city, going through massive transformation, the Paisa culture (people of Antioquia are different than the rest of the country. Take a flight from Bogotá (1 hour) or take a bus to Medellín (approx. 6-7 hours). There are lots of bus companies and schedule options. Take a cab into the city (roughly 45-50 minutes into town). To determine how much you should pay for cab fare, try this app. for any city you travel. Medellín is very easy to travel around with its efficient metro system, Metro de Medellin. Most visitors typically remain in El Poblado during their first visit to Medellín. It is a tourist-friendly area with plenty of locations. We recommend for cost, convenience, and service: The Grand Hostel in El Poblado. This is a place with friendly and attentive staff (operated by a lovely Lady Lucy and her dog Lucas), with both private and dorm rooms, and proximity to the El Poblado Metro station. 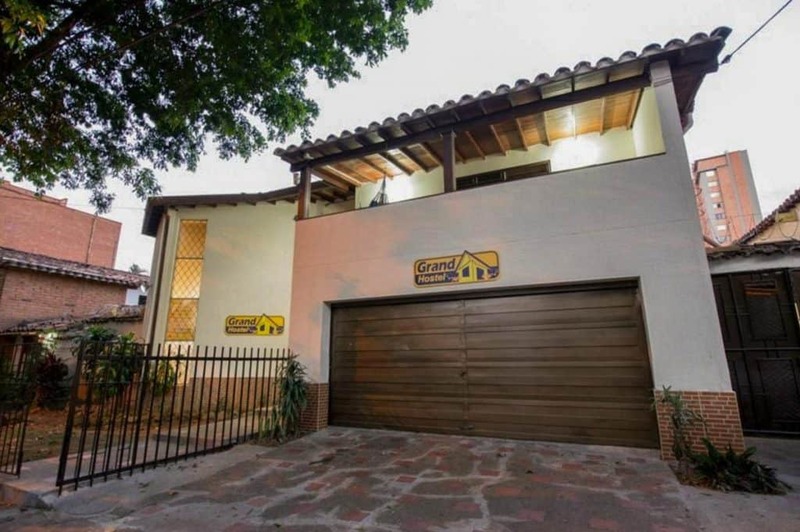 Another low budget option is InMedellín, a small hostel with an excellent location in Poblado. It has comfortable private rooms and dorms. For more pampering, our friends have enjoyed staying at the Charlee Hotel, which has western service. The location is right in the heart of Parque Lleras with restaurants and bars right at your doorstep. We preferred to stay outside of the main areas, such as in Envigado. It offers a more local neighborhood living experience. We enjoyed a long-term stay at 20 Mission, Co-living apartments. This is close to the Colombia Immersion Spanish school, a school that has a more community and local approach to learning. and set in a local neighborhood, which is a perfect place to appreciate a local community and practice your Spanish. Walk to the pier at El Muelle de la Bodeguita, go to any of the office windows and book a day trip. We went to the Rosario Islands. (This is a one-hour boat ride – to enjoy your option swimming, snorkeling, diving, hiking, lunch, then return.) Unlike in Cartagena, the waters here are pristine, clear and blue – it’s the best place to swim in the area. Hotels can arrange a tour for you or you can head to the bus terminal to choose a carrier. The bus trip is around 4-5 hours (depending on stops). Wander in the park, run, swim, hike and relax. Stay overnight in one of many Ecohabs or camping spots. 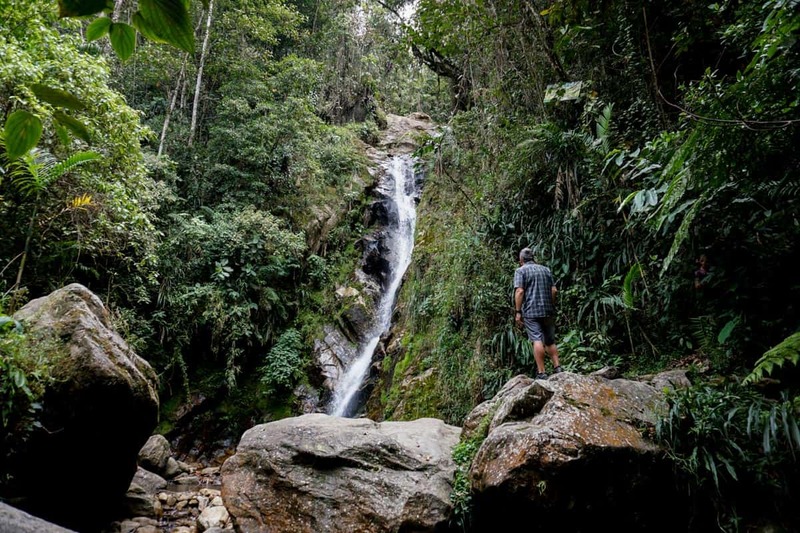 The Lost City Trek is one of our favorite hikes of all time. 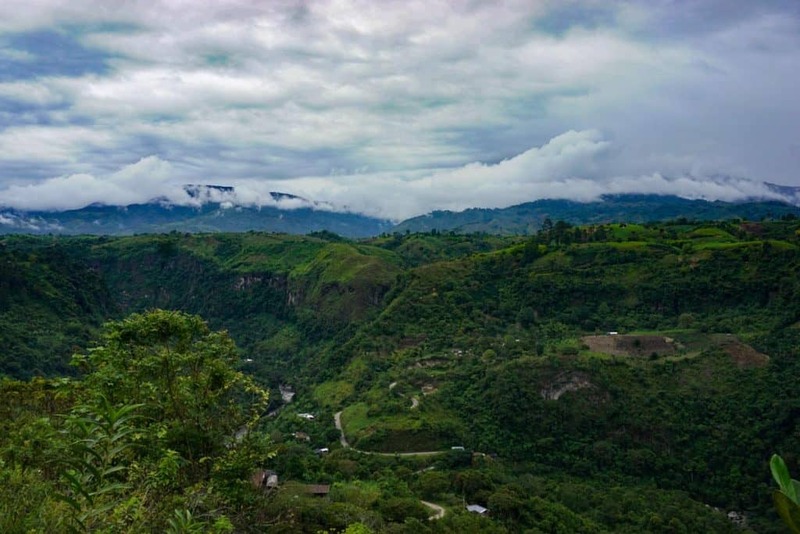 What makes it unique about it is the diversity of landscapes, the local camping experiences and the interesting life of the indigenous tribes in the area. 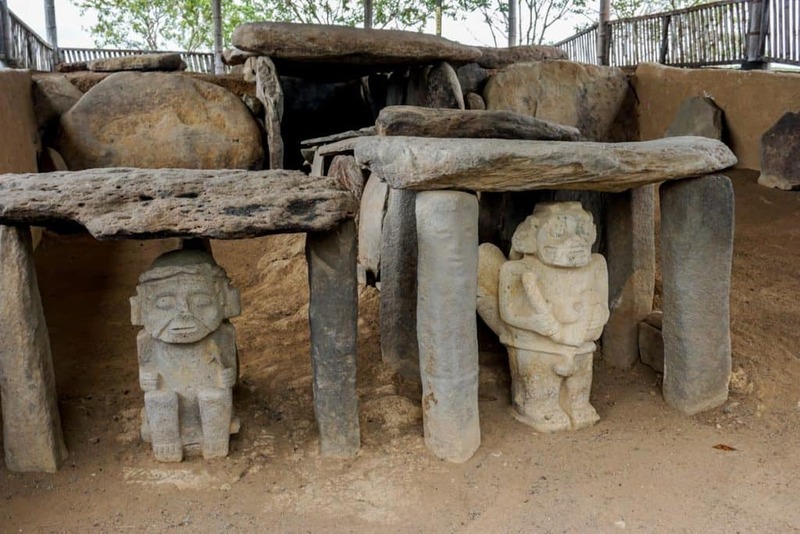 The Lost City area itself is a fascinating site. In fact, the journey itself is exceptional. 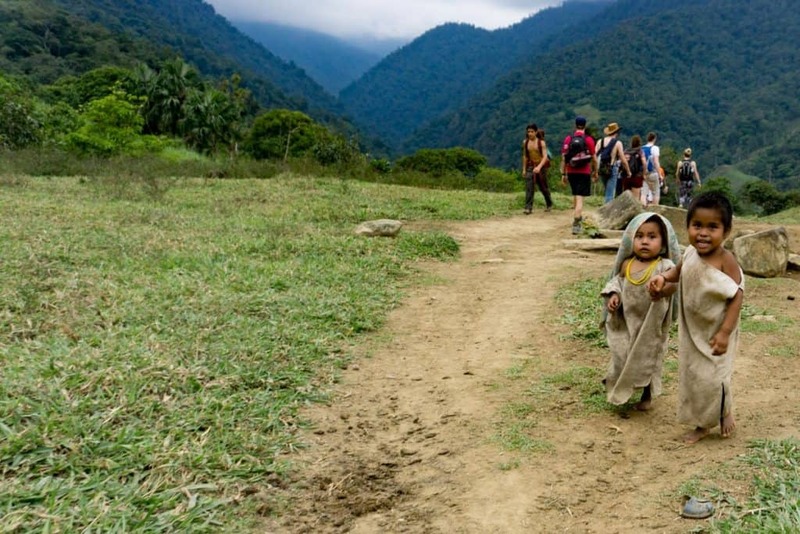 If you visit the Gold Museum in Bogotá before or after this hike, you will understand and appreciate the ingenuity of the Pre-Colombian Teyruna people after you finish the activity. 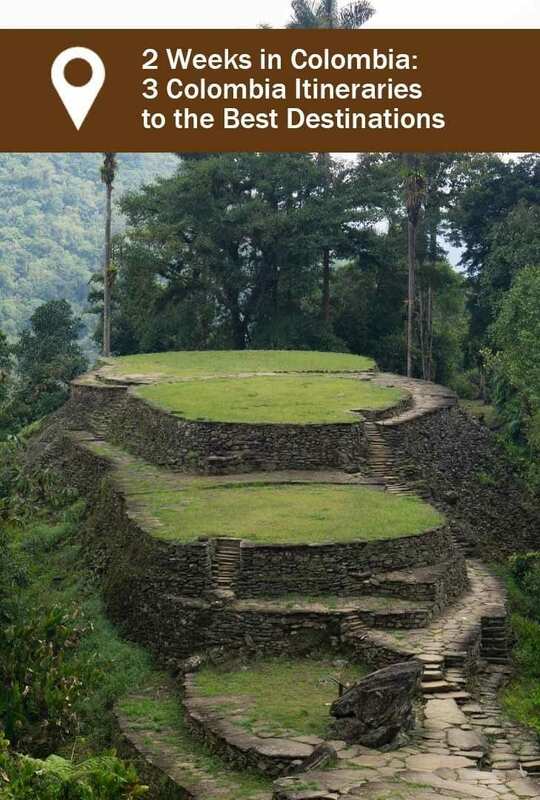 Impulse Travel can book a full trip throughout Colombia and all your other excursions. The hike is a challenging hike in many sections. It’s dusty, muddy but the views are sensational. It’s best for any hiker in good fitness. We recommend the 4-day tour. When your hike is complete around mid-afternoon, you will join your group in the Machete village for a final lunch. You will be incredibly tired from the trek. It’s best to spend the next day relaxing. We recommend spending your evening and next day resting in Minca. It’s a 45-minute drive up the mountains from Santa Marta. We loved Minca! It’s an eclectic, energetic town with lots to do. Find out how to get there, what do to, where to stay, and where to eat, in this post about Minca. Day 12: Travel day down to Santa Marta then onto Medellín. 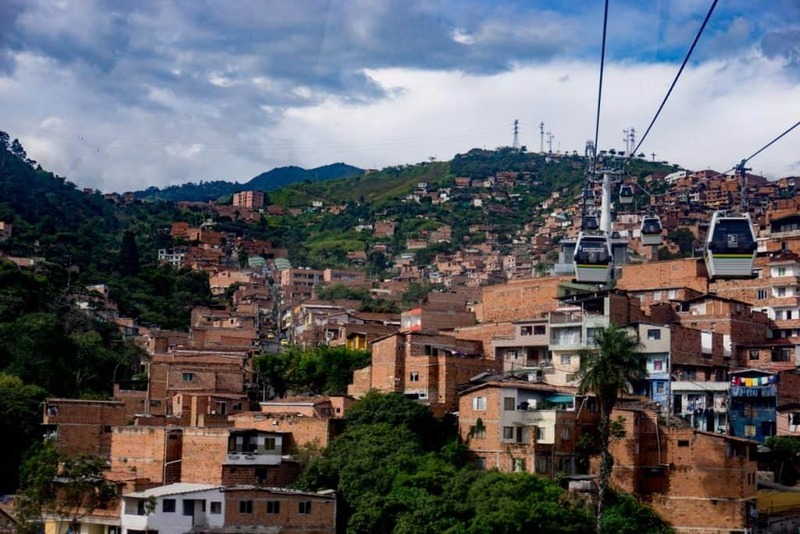 After you arrive in Santa Marta, Take a bus to Medellín (16hrs) or take a flight to Medellín (less than 2 hrs)Take a cab into the city (roughly 45-50 minutes into town). To determine how much you should pay for cab fare, try this app. for any city you travel. Medellín is very easy to travel around with its efficient metro system, Metro de Medellin. We preferred to stay outside of the main areas, such as in Envigado. It offers a more local neighborhood living experience. We enjoyed a long term stay at 20 Mission, Co-living apartments. This is close to the Colombia Immersion Spanish school, a school that has a more community and local approach to learning. and set in a local neighborhood, which is a perfect place to appreciate a local community and practice your Spanish. 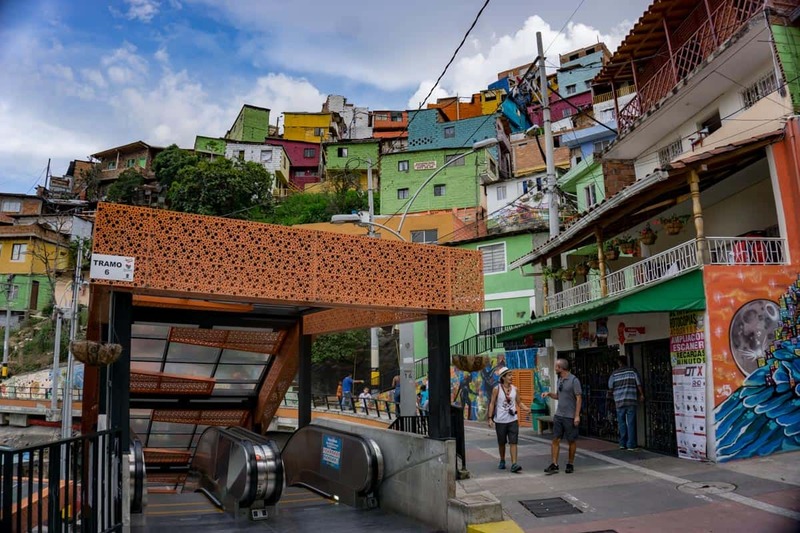 A must see is the Comuna 13 district. Get inspired by witnessing how the city is transforming into a very livable and innovative place. Learn about the struggles of the past and the growing optimism for the future. 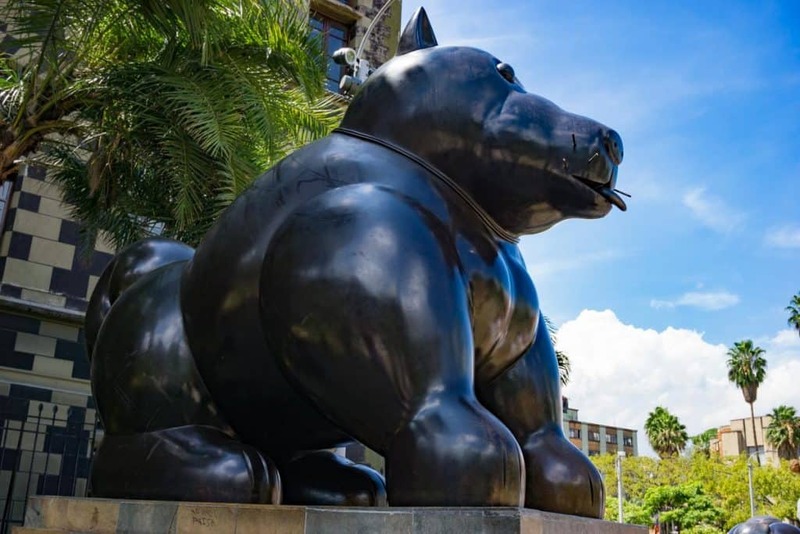 Visit the Plaza Botero in order to see the sculptures of Medellín’s living legend and shop along the plaza. Take the cable car up to Parque Arvi and walk through the parks and forests. Coffee! 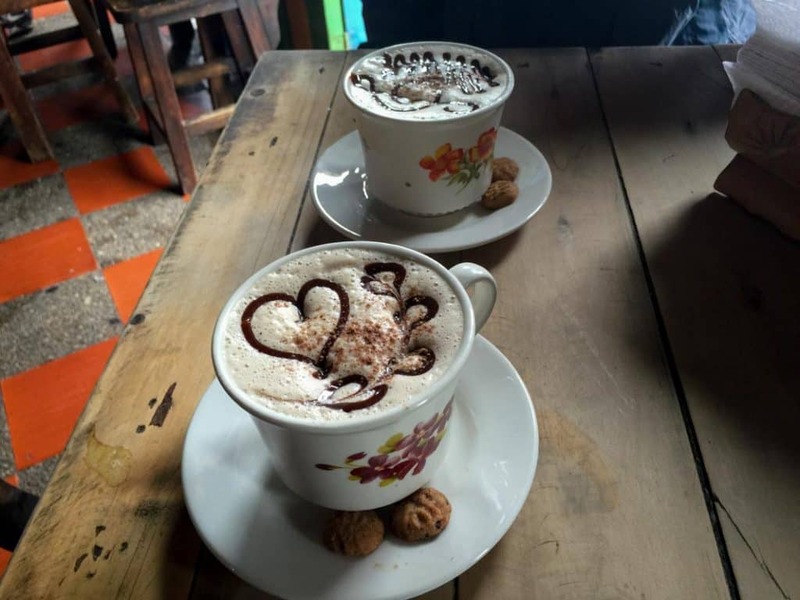 Enjoy the many café options around the city especially in El Poblado. Learn all about typical Paisa food, and discover what kind of foods you enjoy. The Street food tour Medellín is an excellent way to start your stay. Check out the video of our food tour of Medellín. Our choices are based on two factors: good value or fair priced; and decent food. 3 Tipicos – Probably the best of local food. For more restaurant reviews by neighborhood you can find it here. 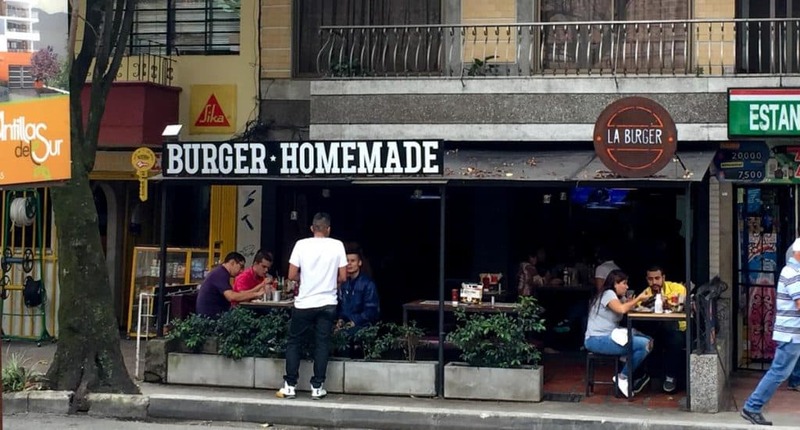 La Burger Bar – handcrafted, city themed burgers and fries. Lots of interesting topping options. Actipan 3 – small corner bakery that makes the best Arepas con huevo (corn arepa with egg inside). Mahalo Action & Sports Bar – Amazing view is the highlight. It is set high above the city up the mountains. Good if you are looking for familiar Western food and sunset ambiance. El Café de Otraparte – Unique and delicious coffees and desserts in a casual garden setting. 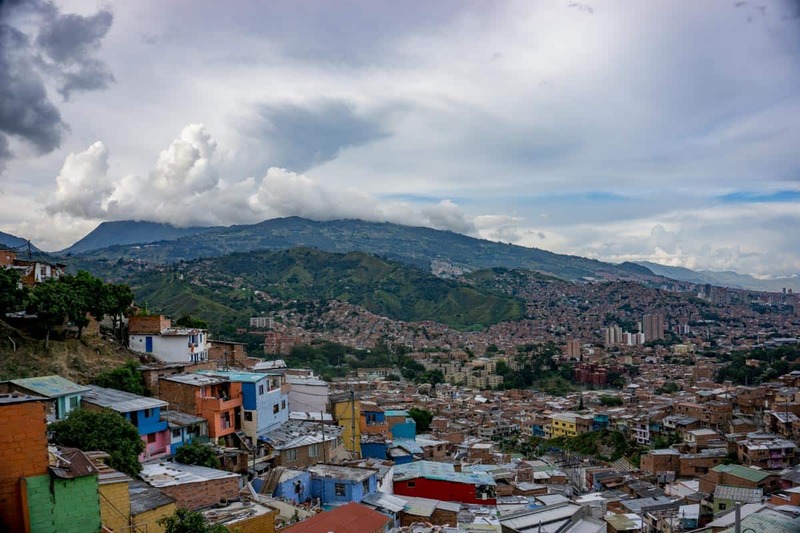 A must see is the Comuna 13 district. Get inspired by witnessing how the city is transforming into a very livable and innovative place. Learn about the the struggles of the past and the growing optimism for the future. La Burger Bar – handcrafted, city-themed burgers and fries. Lots of interesting topping options. Actipan 3 – small corner bakery that makes the best Arepas con huevos (corn arepa with egg inside). Jardín, or Garden in English, is a quiet colonial town, in the southwest region of Antioquia. It’s very local with limited tourists. 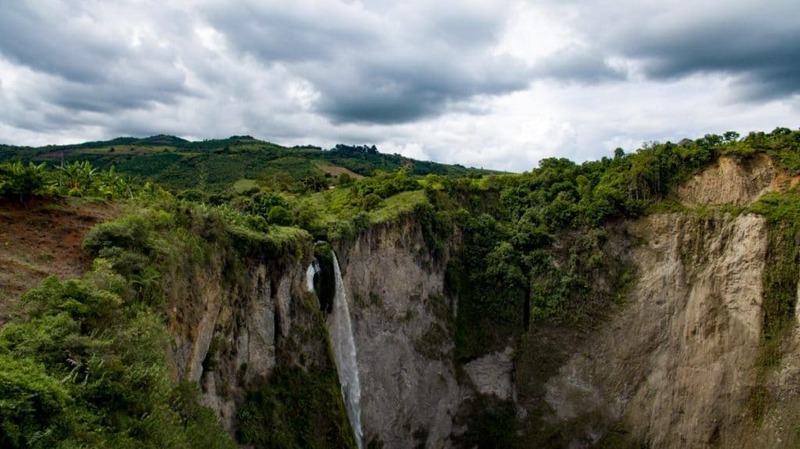 It’s an idyllic location to slow down, hike or horseback to waterfalls or visit a coffee farm. Travel to the South bus terminal in Medellín and take a bus to Jardín. Various small vans travel to Jardín, wherein the trip is three hours away approx. 20,000 COP or $6.50USD. We really enjoyed our stay for three nights at the Hotel Kantarrana Urban Garden. It’s close to the main square and bus terminal, with a unique design and décor, comfortable rooms and breakfast. We recommend a hike (or horseback) to the Cueva del Esplendor (the Cave of Splendour). It starts with a jeep ride up the mountain to start on a scenic trek in farmer’s fields located high above the town, then down into the caves. It’s an excellent and relatively easy hike. Jardin Ecotours offer a hiking tour with a knowledgeable and English speaking guide named Andrés. He also offers coffee tours in the area. We found it difficult to find good restaurants that were open (it was during low season), and a number were closed the week we were there. Best to ask for recommendations when you arrive. Salento will offer you a more vibrant setting than Jardín. It’s a town that knows all about tourism and has ample options for restaurants and cafés and shopping. 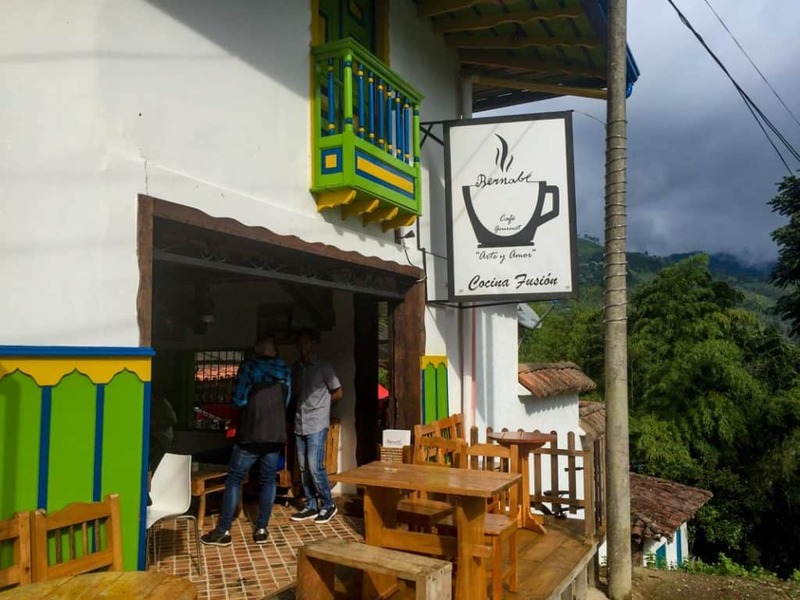 Salento is a short distance to take in a coffee tour or to see the Valle de Cocora. Unfortunately, there is no direct bus route to the Coffee region, particularly Salento. Due to the terrain, with zigzag roads, it’s a bit challenging to traverse the route, yet possible. – Take bus from Jardín to Rio Sucio – Duration: 3 hours cost: 19,000 COP $6.15 USD – Then transfer onto bus to Pereira (or Armenia) Duration: 1.5 hours cost: 6500COP $2.10USD – Then catch bus from Pereira to Salento duration: 45minutes Cost: 5000COP $1.62USD There are multiple buses, and we managed to make each bus in time without waiting very long for the next. 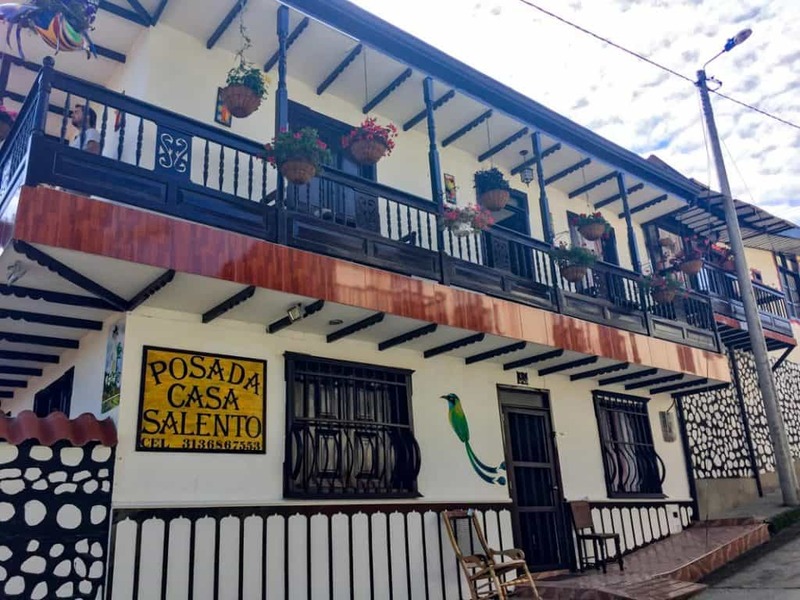 We loved our stay at the Posada Casa Salento, which is a family run home, with comfortable themed rooms, excellent breakfast served on the balcony, and an impeccable customer service to create your perfect plan in Salento. You will see why it’s rated exceptional. 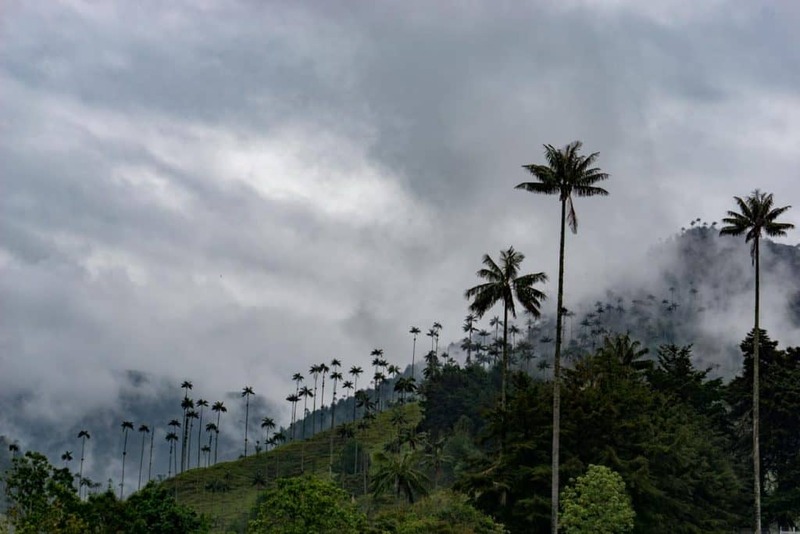 Visit the Valle de Cocora– A walk to see the stunning cloud forest of mountains and towering wax palm trees. All that is required here is heading to the town plaza, and getting on a jeep Willie for the short ride out of town. This is a short walk along the mountains. Unfortunately, the rain was so bad we stopped for only a short period. Then grab a jeep Willie to take you back into town. The vehicles leave at set times during the day; you can inquire with your guesthouse or any of your drivers. There are numerous options to visit a farm, and learn the coffee process. Your guesthouse can help, or various tour guides tout their services on the street. We don’t shop very often anymore, but Salento seemed to have more unique artisanal jeweler and goods that we haven’t seen in other parts of Colombia. Make sure you bargain! Salento has great restaurants, but prices are jacked up in this touristy town. 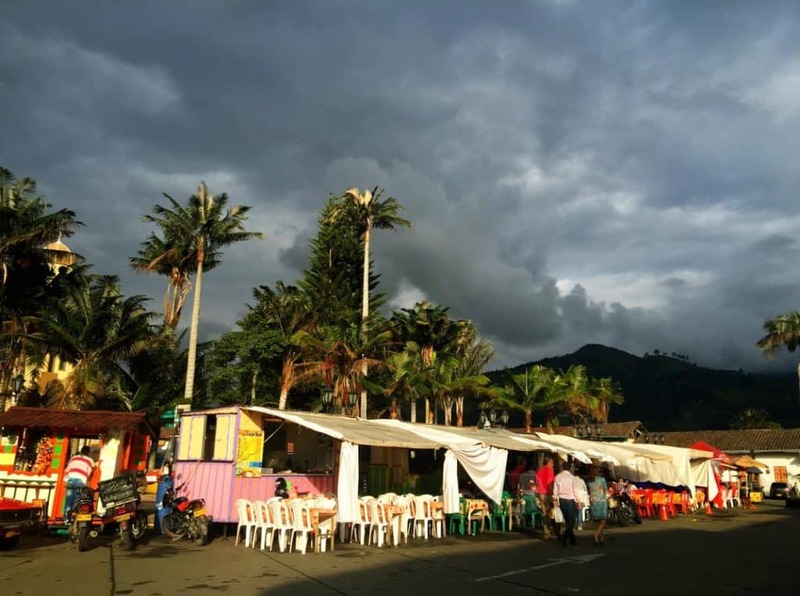 Our favorite spot was the food trucks in the central plaza serving trout or chicken grilled or cooked in various sauces, each served with rice, salad and patacone and salsa for 6100- 9200 COP, $2-3 USD a plate. These were some of our best meals on the trip. Bernabé café – Cocina Fusion – Although a little pricier than our food trucks, we loved their coffees and interesting dishes and it satisfied my craving for pasta. Makao There is no shortage of good coffee in this town. 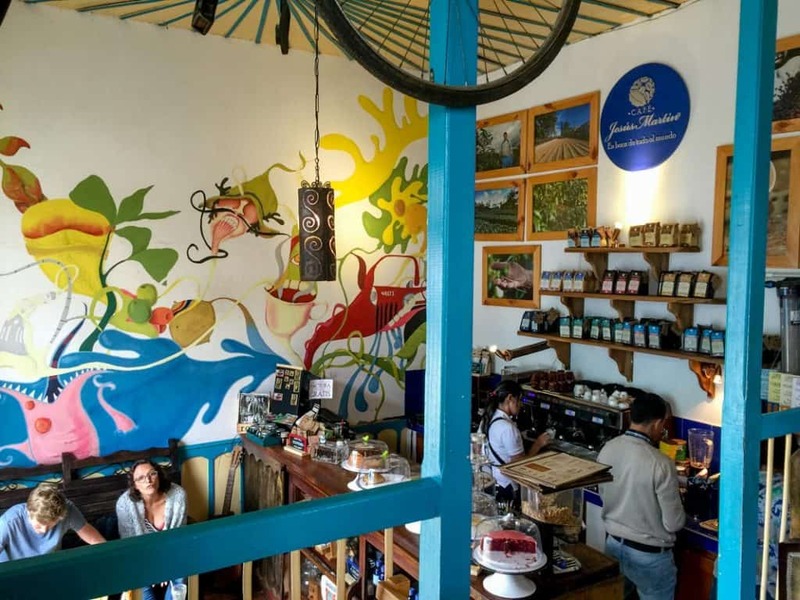 Two of our favorite café’s were: El Tejadito de Salento – Café Arte – Excellent artisanal coffees – on the main street in Salento. Café Jesús Martin – Equally good coffee with special blends to take home. Cali will give you a different perspective on Colombia. It is also a city in massive transformation after the dark days of the Cali cartel were over. The city is renewing and renovating with parks, restaurants and social projects. Not to mention it’s the home and birthplace of SALSA! Travel within Cali: Taxis are everywhere and economical as there are metered taxis. However, we didn’t take a bus, which is called the Mio – similar to the Transmilenio in Bogotá. It’s reasonably priced and efficient (although it can get very crowded during rush hour). Uber runs a low cost and efficient service in Cali as well as in Bogotá and Medellín. We recommend Casa Miraflores, which is one of the coolest/most comfortable hostels we have ever stayed in. It’s a massive Spanish-style home that offers breakfast, with two full kitchens to use, funky lounging areas and comfortable private and dorm rooms. We recommend a city tour to allow you to get a first comprehensive impression of Cali. It’s a great overview of popular neighborhoods, as well as the downtown area. Cristo Rey is a Christ statue located high above the city, with numerous parks and urban projects underway. Valley Adventours offers a driving city tour with an English guide, regularly offered at 4 pm. Duration: 3 hours Cost: 45,000COP or $15USD. This tour company offers several other more outdoors and adventurous tours like waterfall hikes, tubing, paragliding, and kite surfing. We just had a grand time for the city tour, and we plan to come back to see more of the area. 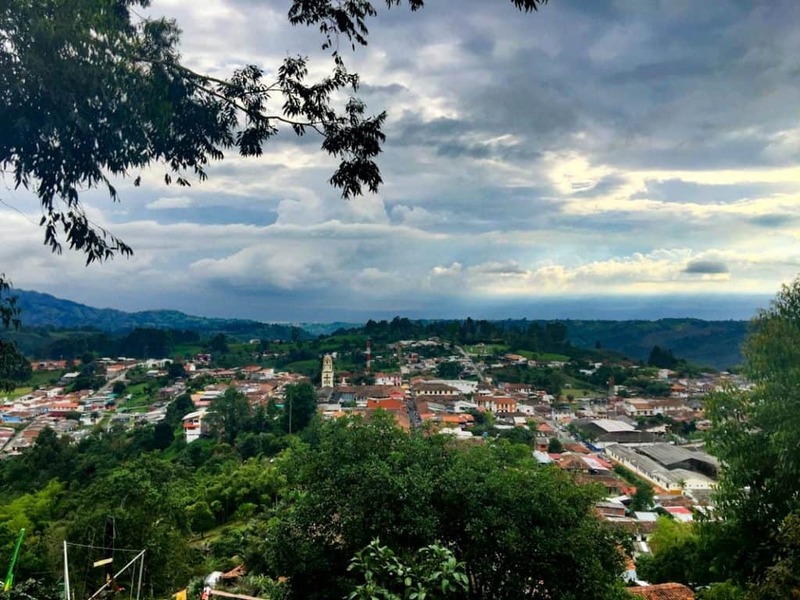 Day 11 –Travel and stay in PopayánPopayán – Or the White City, is an impressive, all white, Spanish Colonial town, with a picturesque landscape of mountains and volcanoes encircling the city. We stayed here for one night, then left to see San Agustín, and headed back to Popayán to see a little more. 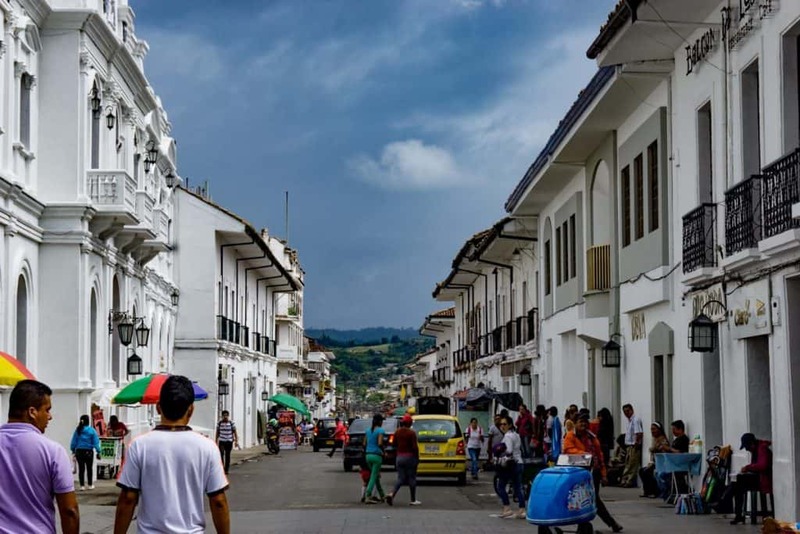 Popayán is a three-hour bus ride from Cali and costs 15,000COP $4.86USD. 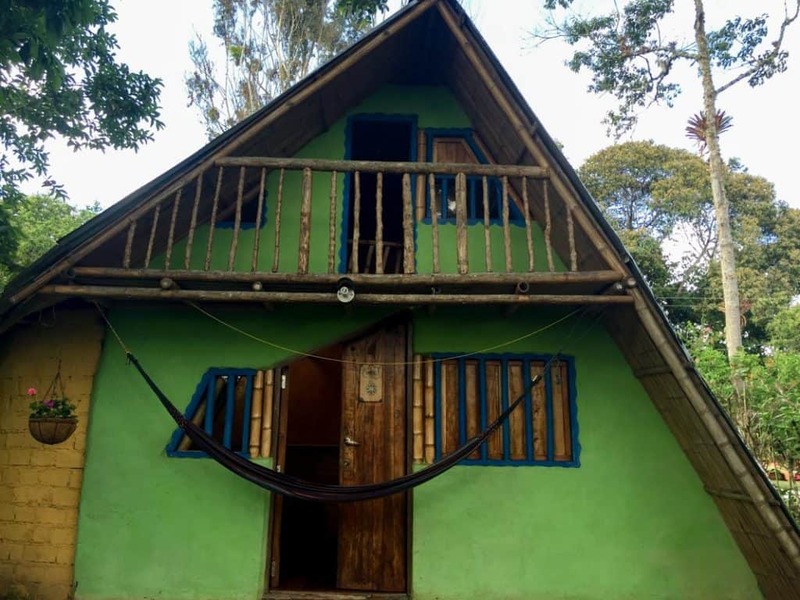 Hostel Caracol is a comfortable low-cost hostel, with private rooms (mostly with shared bathroom), shared kitchen for use, and good café in the front. Wander the streets and take lots of pictures – the all-white facades and Spanish architecture allow for plenty of walking. 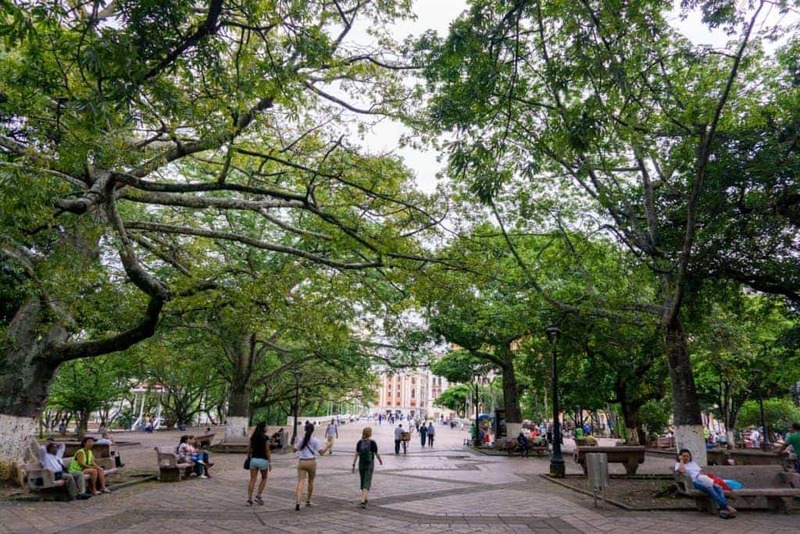 There are impressive buildings like Parque Caldas, Iglesia de San Francisco and an opportunity to step inside the many cathedrals in the city. If you like museums, there are five museums in the central historical area. 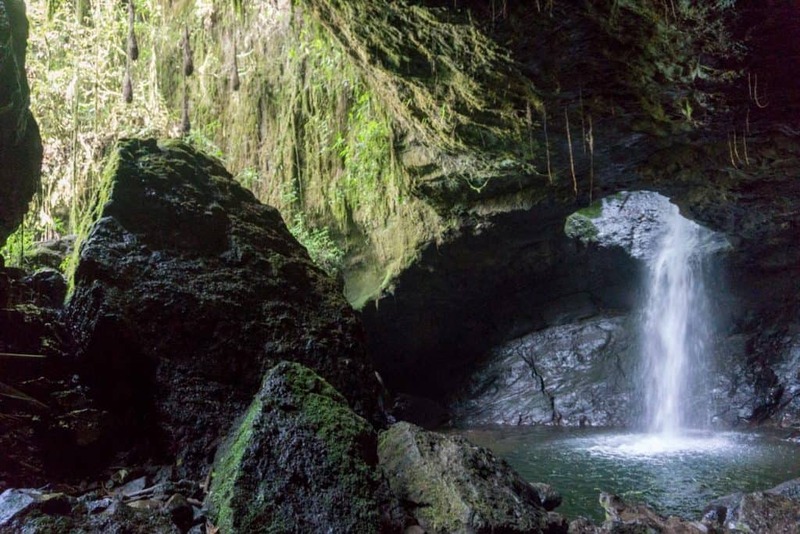 Hiking and biking – There are plenty of tours here to bike to the natural hot springs and complete the Puracé volcano hike. We haven’t done these trips, and we hope to go back soon to enjoy them. 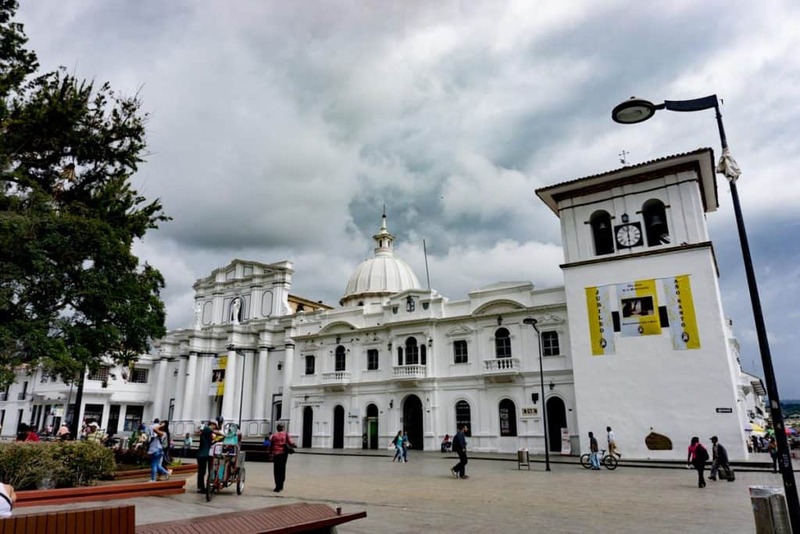 Popayan’s regional dish: It’s a treat to find spicy food – and local food! This is a spicy peanut sauce called Pipian, and you can find it served with Empanadas at places that just a small hole in the wall for a mere 300 COP or 10cents USD each. 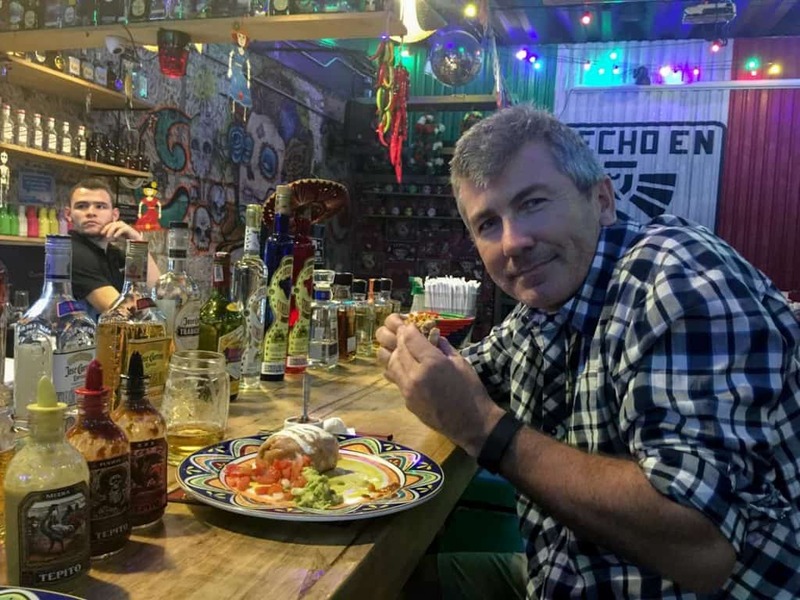 Tequilas – Mexican/Colombian couple – create delicious, spicy and well-priced Mexican dishes (it’s not easy to find spicy food in Colombia). San Agustín is a UNESCO Heritage Site of large Pre-Colombian tombs and statues, but it is also home to many award-winning coffees. Surprisingly, most of the best coffees are not found in the coffee zone. We could not believe our eyes with the breathtaking views of vast canyons, caverns, and waterfalls on our way into the town. The scenery alone is a reason to visit. From Popayán –The bus will only stop at the turn off to the town. However, the bus fare includes a taxi (that was waiting for us when we arrived) to take us up to the city of San Agustín. The bus is a very bumpy, uncomfortable trip winding around an unpaved road for most of the journey. Duration: 5-6 hours. Cost: 20,000COP $6.50USD.When we arrived our cab drove us into town, a slow journey up the winding roads looking over a massive canyon to waterfalls and rivers. It’s incredible! We learned our cab driver Anibal ran a tour company called Anacaona, and with our limited time to visit, we hired him for the day to visit the major archeological sites and points of interest in the area. Our day included the Archeological area sites of Obando, Alto de Los Idolos, Alto de las Piedras and San Agustín. And we discovered the waterfalls and rivers such as El Palmar, Rio Mazamorras, Salto de Bordones (waterfalls) and Salto del Mortiño. There are many eco-lodge style accommodations. We stayed at the Eco-farm El Maco, in one of their rustic cottages. The rooms are very comfortable wood A-frame cabins. Take a morning bus back to Popayán for 5-6 hours then upon reaching the Popayán bus terminal, take a bus back to Cali – 2hrs in the evening. Stay in Cali for the evening. Fly back home via Cali or Bogotá depending on your airline. If you have a few more days to spare, take a look at the other two itineraries for places you may have missed. Looking for more information to travel Colombia? We would love to help you discover more details about this incredible country we have grown to love! 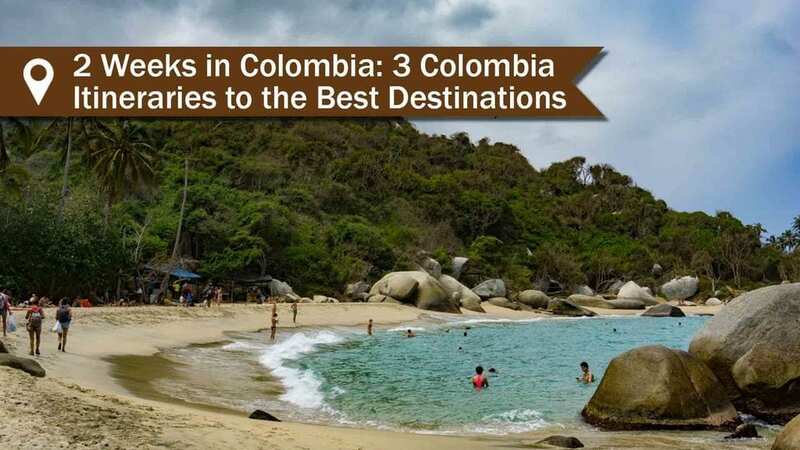 ​For more top destinations in Colombia to discover you can find them here! Have you found a place you want to share with our community? Please comment below.